This view of the Upper Delaware River is at the mouth of Basket Creek, near Long Eddy, NY. 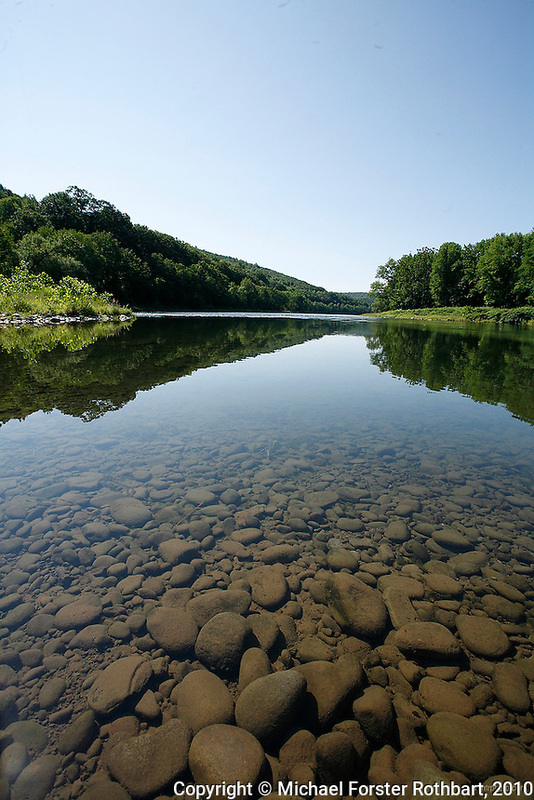 The Upper Delaware Scenic and Recreational River, part of the National Park Service's Wild and Scenic Rivers System, stretches 73.4 miles along the New York - Pennsylvania border. Hydraulic fracturing or "fracking" is new method of drilling for natural gas: millions of gallons of water, sand and proprietary chemicals are pumped down a well under high pressure. The pressure fractures the shale, opening fissures so that natural gas can flow more freely. In August 2010, fracking is being widely used in the Marcellus Shale formation under Pennsylvania while New York considers a moratorium until the environmental effects can be reviewed. The 2005 Energy Policy Act exempted natural gas drilling from the Safe Drinking Water Act (plus some regulations of the Clean Water Act and Clean Air Act), and exempts companies from disclosing the chemicals used during fracking. Scientists have identified volatile organic compounds (VOCs) such as benzene, ethylbenzene, toluene, methane and xylene that have been found in contaminated drinking water near drilling sites. Other environmental concerns include surface water contamination, air pollution, forest fragmentation, plus human health problems. On the other hand, gas companies and property owners stand to earn up to one trillion dollars in profits from drilling in the Marcellus Shale. Date: 8/2010 File#: Canon 5D digital camera frame 68031.